One of a few applications using a superconductor-insulator-superconductor (SIS) tunnel junction is millimeter and submillimeter frequency down converter or mixer; the technology with SIS mixer is the dominating one for receivers of millimeter and submillimeter high-resolution spectroscopy. The most developed technology for producing SIS junctions is Nb-based tri-layer process with the Nb/Al-AlOx/Nb structures proved to provide the most reproducible properties of these devices . Onsala Space Observatory, the Swedish National Facility for Radio Astronomy, has always had a good reputation for producing high sensitivity, low noise receivers. We continued that recently by demonstration of an advanced sideband separation 3-mm mixer with state-of-the-art performance ; the SIS mixer chip for the mixer has been fabricated using dedicated cluster sputter facility placed in the Chalmers MC2 clean room. Due to increasing complexity of the circuits used in modern developments further improvement of SIS mixer technology and tighter control over electrical properties of Nb/Al-AlOx/Nb tunnel structures is required. In particular we need i. accurate definition of the tunnel barrier transparency and hence better control over the current density, ii. 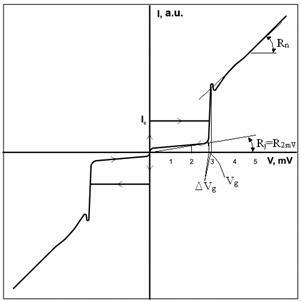 lower subgap leakage current and iii. higher and sharper superconductive gap feature. Figure 1 shows the Nb-based current-voltage characteristic and the typical cross-section of Nb/Al-AlOx/Nb tunnel junction: the tunnel barrier is an extremely thin, 2-3 atomic layers, 8-14 Å thick film interfaced towards upper Nb-layer and lower Al-layer. Already for a long time it was understood that the interfaces between the films in the Nb/Al-AlOx/Nb tunnel structure are responsible for the junction performance, especially presence of the thin Al-layer and associated with that diffusion of Al into niobium ground layer . Specifically, the critical interface parameters are chemical elements profiles across the interfaces and topography features of the adjacent layer surfaces constituting the tunnel junction. Fig.1. Cross-section of Nb/Al-AlOx/Nb SIS junction (a) and its Current Voltage characteristic (b). Parameters Rj, Rn, Vg and ΔVg are critically depend on the internal interfaces in the Nb/Al-AlOx/Nb sandwich. In order to study this complex structure with extremely sensitive AlOx tunnel barrier we need an appropriate analytical method that should combine high element sensitivity, over‑area average technique and non-destructive way of getting the data. Unfortunately neither of standard analytical methods could fit this demand. Auger electron and X-ray photoelectron types of spectroscopy provide very high element sensitivity and extremely low depth of analysis; the latter force using of ion sputtering to build element profiles. Selective sputtering together with radiation-stimulated processes always make the results of such profiling kind of doubtful. Rutherford backscattering of MeV-energy light ions apparently does not change the structure it studies. However it does not allow resolving thin light element layer inside a thicker and heavier environment. Finally, transmission electron microscopy providing very precise knowledge about the interlayer structure appears to be destructive and has extremely low analysis area that is not appropriate. The research group at the Surface Analysis Lab, Moscow Power Engineering Institute (MPEI) has long and extensive experience in the theoretical studies of backscattering of keV-energy electrons and ions reflected from solid layered surfaces [4-7]. The specific of the group expertise compared to a wide variety of other works in this field is their knowledge and ability for analytical description of the higher energy loss range of the spectra of the backscattered electrons. Importantly these novel analytical results do not require development of hardware and have been achieved purely by deeper understanding of electron backscattering process and numerical analysis. This allows us to consider of in situ film growth monitoring using, e.g., Auger electron spectroscopy head. Please, follow this link to learn more about the method. 1. M. Gurvitch, M.A. Washington and H.A. Huggins. High quality refractory Josephson tunnel junctions utilizing thin aluminum layers. Applied Physics Letters, 1983, v.42, No.5, p. 472. 2. V. Vassilev, V. Belitsky, C. Risacher, I. Lapkin, A. Pavolotsky, E. Sundin, “A Sideband Separating Mixer for 85–115 GHz”, IEEE Microwave and Wireless Components Letters, Vol. 14, No. 6, pp.256-258, 2004. 3. C.C. Chang, M. Gurvitch, D.M. Hwang and C.W. Blonder. Auger electron spectroscopy, transmission electron microscopy and scanning electron microscopy studies of Nb/Al/Nb Josephson junction structures. Journal of Applied Physics, 1987, v.61, No.11, p. 5089. 4. Afanas’ev V.P., Naujoks D., “Energy spectra of electrons reflected from layered targets”, Zeitschrift für Physik B. Condensed Matter, p. 397, v.84, 1991. 5. Afanas’ev V.P., Naujoks D., “Inelastic high-energy electron spectra from plane parallel layer non-homogeneous surfaces”, Zeitschrift für Naturphysik, v.46a, p. 851, 1991. 6. Afanas’ev V.P., Fedorovitch S.D., Lubenchenko A.V., Rijov A.A., Esimov M.S., “Kilovolt electron backscattering”, Zeitschrift für Physik B, v.96, p. 253, 1994. 7. V. P. Afanas’ev, A. V. Lubenchenko, S. D. Fedorovich, A. B. Pavolotski, “Reflection of keV-Energy Electrons from Multilayer Surfaces”, Technical Physics. v.47, No.11, p. 1444, 2002.